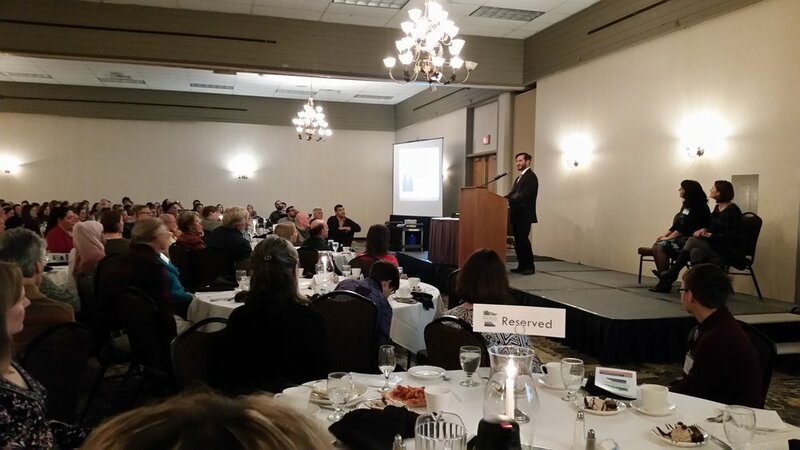 The 2017 Legal Services Statewide Conference: Connecting With Our Community was the ideal setting in which to recognize the achievements and commitment of outstanding legal advocates across Minnesota. On October 26, the statewide awards dinner provided an evening of inspiration and celebration as conference attendees and guests gathered to honor their peers. Emcees Anne Hoefgen, executive director of Legal Services of Northwest Minnesota, and Dori Streit, executive director of Legal Aid Service of Northeastern Minnesota read handwritten "shout-outs" throughout the evening. These "shout-outs" were an ad-hoc and anonymous way for any conference participant to publicly share acknowledgement and gratitude for a colleague. 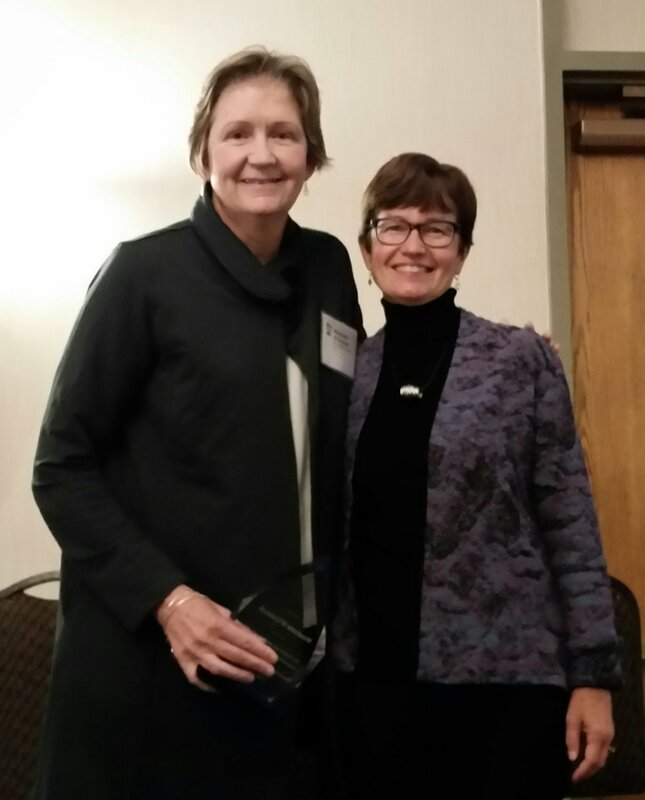 The evening included the presentation of LSNM's longstanding Dawn Carlson Family Advocacy Award, open to all Minnesota attorneys, and given in appreciation of the unsung heroes of law practice who serve low-income clients. It was awarded to Douglas Hegg of Hegg Law Office, a solo practitioner in Alexandria, MN. During the past 15 years, Hegg has represented more than 450 low-income clients through LSNM's judicare and pro bono programs. Also honored were Maureen O'Connell of O’Connell Consulting, LLC and former executive director of the Legal Services Advocacy Project and Legal Services State Support, and Cathy Haukedahl, recently retired executive director of Mid-Minnesota Legal Aid. Haukedahl and O'Connell were presented with the Minnesota Legal Services Coalition's Pillar of Justice Award in recognition of their undeterred and exceptional support of equal justice throughout their careers. Legal services staff members marking a quarter century of service were also recognized, and staff in various stages of their tenures were asked to stand and be applauded, including those new to the field. The ceremony concluded on an uplifting note with a screening of the Coalition-produced video about legal aid's impact. Registration Commences for October Statewide Conference! State Support is excited to announce that registration opens today for the 2017 Legal Services Statewide Conference: Connecting With Our Community. The conference will be held at Arrowwood Resort and Conference Center in Alexandria, MN from Wednesday, October 25 to Friday, October 27, 2017. Conference-goers can expect to learn more about innovative service delivery models, how to better serve our diverse client populations, and how effective self-care translates into more sustainable and effective advocacy. Attendees can earn up to 13.75 hours of Minnesota CLE credit, including standard, elimination of bias, and ethics credits. Zoua Vang, storyteller, strategist, and advocate, will officially kick off the conference with a special keynote presentation, "Our Community, Our Stories," on Wednesday evening, October 25. Vang's personal story inspires and profoundly illustrates why what we do matters. As a professional advocate, she will help us understand how to share and celebrate the work we do on behalf of clients every day. On Thursday morning, October 26, the community will come together for a conversation between the two newest associate justices on the Minnesota Supreme Court. Justices Margaret Chutich and Anne McKeig will discuss their backgrounds and respective journeys to the bench, and share some reflections about their first years on the Minnesota Supreme Court. The conversation will include their thoughts on access to justice issues and legal aid's role in Minnesota's civil justice system and the delivery of legal services. A highlight of this year's offerings will certainly be a one-of-a-kind interactive session led by The Theater of Public Policy (T2P2). Described by the Star Tribune as "CSPAN being swarmed by the cast of SNL," The Theater of Public Policy explores big ideas using improv comedy. To register for the conference, and find out more about breakout sessions, speakers, and social activities, visit our conference page and click on the Register tab. Then, just select your participant type. Please encourage your colleagues to register - in 2015 the conference attracted over 200 attendees! See you at Arrowwood! Sneak Peek: Conference Schedule 2017 Online Now! With the official launch of registration only one month away (Sept. 6), State Support is excited to unveil a sneak peek at the wide array of sessions planned for the Legal Services Statewide Conference in October. This year's conference, "Connecting With Our Community," provides conference-goers with up to 13.75 hours of practical and meaningful CLE credit, along with the annual awards banquet, and opportunities to network and relax with statewide colleagues. On Thursday evening, October 26, the conference itinerary will feature a special screening of the Academy Award-nominated documentary 13th. Named for the 13th Amendment to the U.S. Constitution, the film was directed by Ava DuVernay and is a Netflix original documentary. It takes an in-depth look at the racial inequality in the United States prison system, focusing on the criminalization of African Americans and the prison boom. If books are more your style, join your colleagues on Wednesday evening, October 25, in a thought-provoking conversation about Bryan Stevenson’s bestselling memoir, Just Mercy. A powerful true story about the potential for mercy to redeem us, and a clarion call to fix our broken system of justice, Just Mercy will engage our minds and inspire us to continue pursuing justice for all. Start planning your personal itinerary now, and join us at Arrowwood Resort and Conference Center October 25 - 27, 2017. Look for the official registration invitation in your inbox, or check SCHED for registration links starting on September 6. See you at the conference! The 2017 Legal Services Statewide Conference: Connecting With Our Community, will offer the great mix of camaraderie, meaningful CLE, and relaxation conference goers have come to expect, as well as some new twists. Chief among them, a one-of-a-kind interactive session led by The Theater of Public Policy (T2P2). Described by the Star Tribune as "CSPAN being swarmed by the cast of SNL," The Theater of Public Policy explores big ideas using improv comedy. T2P2 improvisers use comedy to act out hard-to-digest concepts with the goal of helping us think more deeply, and in a fresh, engaging way about the issues we encounter daily and the policies impacting our work. The conference will be held at Arrowwood Resort and Conference Center in Alexandria, MN from Wednesday, October 25 to Friday, October 27, 2017. Stay tuned here for more session and special guest details, a sneak peek at our full conference schedule, and the official launch of conference registration in early September.